Happy Wednesday friends! I hope you are all having a great week! 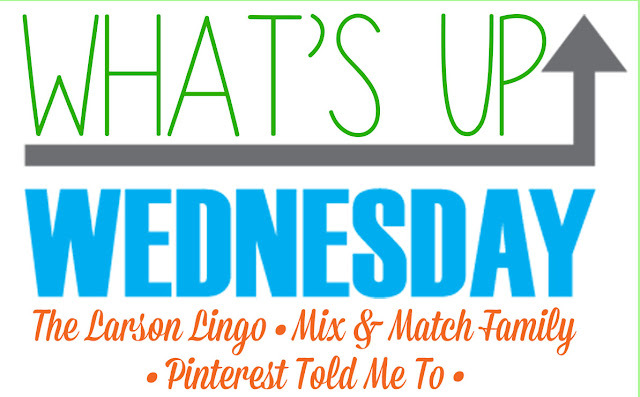 It's the last Wednesday of the month which means I am linking up with a few of my favorite girls today... Mel, Shay and Sheaffer for a little What's Up Wednesday. It has been a beautiful Summer and the weather doesn't appear to be cooling down anytime soon. 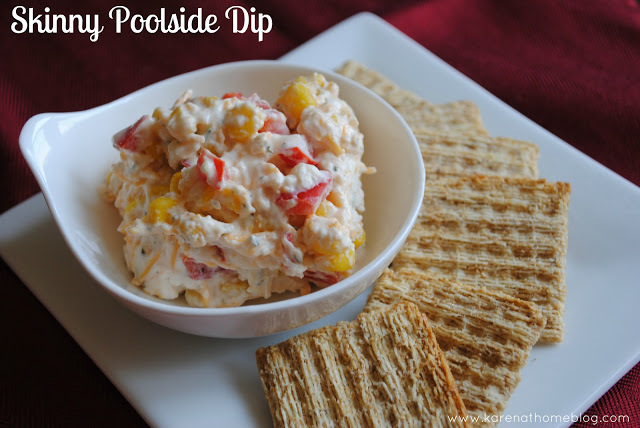 Fortunately for us, our pool is going to stay open past labor day this year and what doesn't go better pool side than my Skinny Poolside Dip! There is nothing in the world I would rather eat than dip and this is certainly one of my favs this time of year. With the start of a new school year a few weeks ago, I have been reflecting a lot this month about how much my babies have grown. Jillian is no longer a Kindergartner (sob!) and Nicholas is starting his last year of preschool next week. I always go through a little bit of a "mourning period" this time of year, I miss our carefree days of Summer and think about just how far we have come in the last 6 years as a family. Next year at this time I will have 2 kids in school full time and am completely conflicted with mixed feelings of shock, sadness and perhaps a little bit of pure excitement that maybe, just maybe, my house may remain clean for more than 30 minutes? Jillian's first day of school printable can be ordered here. Swimming, swimming... a little soccer and football and then more swimming. We have been making the most of our last few weeks of Summer and spending every moment we can at our neighborhood pool. and Nicholas has started Flag Football again. Jeff is helping out with coaching this Fall for Nicholas's Flag Football team which should be a lot of fun. My little guy loves football! OK, so don't laugh but I came across my collection of Sweet Valley High books in the our basement this Summer and decided that these were the perfect Summer reads. Crazy? A little but I can honestly say reading these again has been so rewarding and calming. I have enjoyed them so much that I have ordered a few more to add to my collection and can't wait for them to come in. They are just fun, easy and quick reads and with little ones, this all about what I can handle at this point. It's been fun taking a little trip down memory lane this Summer. Honestly, I began this Summer with the intent of "slowing down before speeding back up again." I put a lot of hobbies/projects/blogging on the back burner this Summer and wanted to just focus on the kids and finding my true passion. With Nicholas starting school next Fall, I don't have any intentions of going back to work full time and want to find something that I can do for years to come and work from home. I have been so happy with my "Summer of Rest" that it has allowed me to truly slow down and think about what I REALLY want to do as we embark on a new chapter in our lives. Decorating for Fall and Football! I plan on going through our Fall decor in the next few weeks and also will be hitting up Homegoods during those few hours when Nicholas is in preschool. Our family LOVES football at every level and can't wait to cheer on Ohio State and the Browns this Fall. We kicked off our high football season by attending the home opener this past Friday and the kids had a blast. Basically this time of year my wardrobe consists of tanks and shorts. Anything to stay comfortable in this heat and humidity. I about died sitting outside watching Soccer practice last week it was so hot. Any make up I had put on beforehand probably slid right off! My favorite Summer tank has been this one from Jane.com. I have them in 4 different colors and noticed this week that they have come out with some colors for Fall too. Not the best pictures but I am wearing the Royal blue tank above and pink tank below. Clearly a favorite for me! I am eyeing the Ivory and Cranberry colors next as the perfect layering piece for cardigans this Fall. I think what I am most excited for is this little man going to school. He has truly missed his sister ever since she went off to school a few weeks ago and must ask me 20 times a day if it's time to get her off the bus yet. It seems like he just counts down the minutes until she is home! I have also noticed more than ever that he is craving some structure and socialization. He had a great year last year and know he will have an even better one this year!